I have loved How I Met Your Mother since my friend Hope introduced me to the first season on DVD during winter break freshman year of college. I love the characters, the dating rules, and the writing. I liked the way the show was so well planned that stories referenced in season one reappeared in later episodes. As time went on, however, I started noticing that characters were changing in ways that I didn’t always like. As they met new challenges and crises, Marshall, Lily, Ted, Robin and Barney had to learn to grow up and let some dreams go while clinging to others. 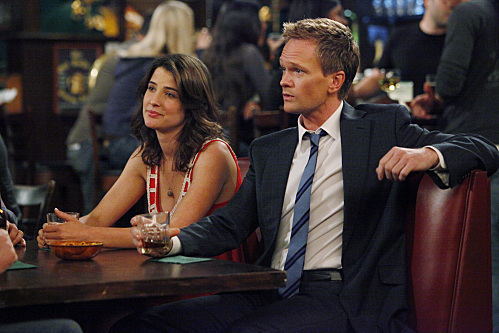 While Marshall and Ted have gotten to achieve their dreams, the women on How I Met Your Mother both have not achieved the goals they set out in season one and have changed significantly since those first episodes. For those who aren't familiar with the show, it is currently in its seventh season. Ted Mosby is telling his children how he met their mother, starting from the day his best friends Lily and Marshall got engaged until... whatever happens a season from now (hopefully - I love the show, but come on!). There's a lot of show to discuss, and I'm going through major plot arcs quickly to make my points. If you want to have a better understanding of the plot lines in the past several years, here is a more detailed summary. While Lily and Robin have either given up or continue to struggle towards their dreams, Ted and Marshall have stumbled towards their life-long goals. Additionally, Ted, Marshall and Barney all have prestigious jobs – architecture professor, lawyer, and possibly an international businessman? – while Lily is a kindergarten teacher and Robin is still struggling to be a reporter. I don’t mean that these characters are more successful, but doesn’t that seem unbalanced? Ted gets to accomplish his dreams, albeit by a different route than he had planned, while Lily becomes stagnant and Robin spirals through failures and broken relationships. "It's just that the whip is not a toy, Ted. There's such thing as common sense, you know." Ted’s ultimate architecture dream is to design a building in the New York City skyline. He wants to be able to point to it on the horizon and say, “Yep, that’s mine.” After a few years of struggling at a large firm, he loses a major account with Goliath National Bank and gets fired. He decides to start is own firm, Mosbius Designs. When it fails, Ted thinks he will have to give up on his dream of building that NYC skyscraper. After his ex-fiancée's new husband pulls some strings, Ted "settles" for a job as an architecture professor at Columbia. Columbia. Not a small community college, not even a SUNY branch, but Ivy League Columbia. Then after a while, Ted's drawings for a Goliath National Bank building get pulled up again and he becomes the youngest architect to design a skyscraper in New York ever. He even makes the cover of New York Magazine. So Ted's wildest dreams are coming true, despite his angst over "settling" into a nice job at Columbia. Sure, he still hasn’t met the mother, but we all know it’s going to happen eventually. The show is extremely popular in France, where it is referred to simply as "How I Met." Lily's dreams have gone in a different direction. We're introduced to Lily as a woman who works as a kindergarten teacher to pay the bills, but who truly wants to be a painter. She is also an obviously modern woman; during Thanksgiving dinner with her fiancé Marshall’s family, she announces her intention to keep her last name once they get married. Lily struggles to be her own, independent person and in the first season wonders if getting married is the best decision for her. She had wanted all sorts of experiences – living as a painter in Paris, maybe seeing what dating women was all about – but had met Marshall on the first day of freshman year and hadn’t done any of the things she’d planned. At the end of the first season, she accepts a place in an art fellowship in San Francisco and leaves Marshall in order to pursue her dreams. Things don't work out as she planned. Her instructor thinks that Lily is a terrible artist. She moves back to New York, gets back together with Marshall, and decides to find a new career. After trying many occupations - life coach, beekeeper, administrative assistant at Ted's architecture firm - Lily realizes that she's actually quite good at being a kindergarten teacher. She goes back to teaching youngsters and continues to paint on the side. Her paintings don't bring in much money - she learns that aside from Marshall, dogs are the only creatures that appreciate her art. She sells paintings to veterinary clinics, but overall has not succeeded in becoming an artist. She has, however, found a career that she's good at and seems to enjoy, and she arrived at that decision mostly on her own. After the second season, Lily's career is never as central as Marshall or Ted's, and her role on the show is as a wife and friend rather than as a professional. "Coming up next, is your local ice cream man actually driving a roving meth lab on wheels? Stay tuned for the full... scoop." Robin, on the other hand, starts out as an independent career woman. She often abandons romantic relationships because she's more focused on her job as a reporter. Part of the reason that she and Ted don't work out as a couple is that she wants to be free to move to another country and have adventures, while he wants to settle down and have a family. She has always been the independent woman, but her career is usually the source of many of the show's jokes. After a stint covering fluff pieces for Metro News 1, Robin becomes the lead anchor on a 4 AM news show with a tiny viewership. Later, she co-anchors the show with Don, a washed-up newscaster. She inspires Don to do his job well and they date, fall in love, and move in together. Because of their rapport, their news program becomes wildly successful and Robin gets offered a better job in Chicago. When she turns it down to stay with Don, the network offers the job to Don, who takes it and moves to the midwest. To comfort Robin when Don leaves, Ted explains that this is a good sign - Robin has grown as a person to be able to choose love over her career. But then what? Robin gets an obnoxious, ditzy co-anchor and eventually applies to be a researcher at a serious news organization. Now the only shots of Robin at work are of her being jealous of her coworker Nora, Barney's new girlfriend. She is presumably working her way up the ladder to be a serious journalist, but her main storyline this season has revolved around her unrequited feelings for Barney. Robin used to be a strong female character, and now in the most recent episode, she is described as "almost as messed up" as Barney, who sports commitment issues, abandonment issues, and a potentially unhealthy love of suits. When and how did that happen? In some ways, Robin's story can be seen as an inspiring one for women who want to make it in challenging industries. Despite numerous setbacks, Robin keeps working and seems to have gotten herself on a path towards being serious journalist. However, as with Pam Beasley on The Office, it seems unnecessary for the writers to take a strong female character and break her down into a messed up, confused person with a questionable career future. It would be frustrating enough for me as a viewer if it was just Robin, but it is worse in contrast to Ted's supposed failures. I love Barney and I want to be Neil Patrick Harris's best friend. When Ted and Marshall don’t get the jobs they want, they still get high-status jobs that many people would covet. By contrast, Lily does get a great job that she’s good at, but after the second season there’s never any talk of her advancing in any way. She has her job, and then she gets to focus on being a bride and potential mom. Robin’s failures bring her to some awful projects: she auditions to be the girl who reads out the lotto balls on TV; she works in Japan, but with a chimpanzee co-host; she shoots a commercial for adult diapers. While the men’s careers have remained a significant part of the story each season, Robin’s love life and Lily’s motherhood decisions have become their most important contributions to the overall plot. Robin’s role in the current season seems to be to pine after Barney and be there for the Canadian jokes. The show has been picked up through an eighth season, so the writers still have time to turn Robin's character around and maybe make Ted’s life a little less charmed. I'm trying not to get my hopes up. What do you think of the How I Met Your Mother characters? What do you think of the current season, if you watch? Also, isn't Neil Patrick Harris great? Check this out if you haven't already.